Chicago’s green credentials are well established. We’re America’s only recycled city (rebuilt 1872), we’re nicknamed after renewable energy and our Cubs do their darnedest to prevent fans from bothering to drive to Wrigley. Now the co-founder of the Global Cleantech Cluster Association (GCCA), Shawn Lesser has listed ten more reasons why we can, and should, be a cleantech hub. As managing partner of trans-Atlantic investment bank, Watershed Capital Group, Lesser’s opinion comes with serious credentials. His list is below. Seeing as it was first published in February 2011, we’ve taken the liberty of updating it to account for intervening developments. Exelon and the SunPower Corporation are helping make Chicago a center for green employment. The 2012 World Business Chicago report, A Plan for Economic Growth and Jobs, shows we’re now the US’s second-largest center for clean jobs, with 79,388. Chicago is home to many large cleantech corporations, including heavyweights such as SoCore Energy and G-Tech Energy, Inc. Other reports also indicate significant advancement in the cleantech startup sector. As of October 2010, the Department of Energy had retrofitted 19,000 homes with energy efficient improvements; 30,000 square feet of green roofs had been established by the Department of Aviation; and energy-efficient code updates had been mandated by the Department of Buildings. Our mayors make moves. At the time of Lesser’s report, Daley had created the Chicago Green Office Challenge and Chicago Climate Action Plan. Now Rahm Emanuel is showing similar dedication. Since taking control, his legislation has prompted ComEd to invest $2.6 billion modernizing Chicago’s smart grid technologies. Providing networking opportunities to businesses in wind, solar, biomass, biofuel and general cleantech sectors, the Chicago Clean Energy Alliance (CCEA) is alive and well. Just last week, they hosted a successful cleantech pitch competition in association with the GCCA. 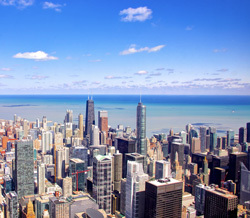 Chicagoans are embracing renewable energy through the Chicago Climate Action Plan. We’ve also seen significant activity from the Chicago Green Homes Program, which promotes water-, waste- and energy-efficient residential living. A variety of global cleantech companies have set up headquarters here, including Chinese wind energy company, Goldwind, plus Johnson Controls, Siemens Building Technologies and Schneider Electric. Awareness programs are driving greater community interest in sustainable housing. The Museum of Science and Industry’s “Smart House” and the Chicago Centre for Green Technology both showcase the upside of eco-friendly housing. In doing so, they’re growing the market for residential-focused cleantech companies. Universities are also introducing cleantech programs into their curriculum. DePaul, IIT, and UIC all feature programs, while the University of Chicago has a cleantech lab. City officials have set ambitious goals for the expansion of sustainability initiatives. By 2020, they want 50% of Chicago buildings to be energy efficient and 35% to consume zero carbon-derived energy. They also want 90% of new construction to be built green. In conjunction with the Chicago Region Environmental and Transportation Efficiency Program (CREATE) and the US Department of Transportation, Chicago is developing a High-Speed Rail Plan to promote environmentally friendly transportation.